On a recent trip to Mexico City, the crowded street-food hubs basking in the hot city sun amidst the bustling streets, inspired me to learn more about the jam-packed flavours, colour and history Mexican cuisine has to offer. Mexico is full of sun, dance and mystery and the rich food culture is something that encapsulates all of these features; something we could all learn a little from. Salsa, or Pico de Gallo came to fruition by the Aztec, Mayan and Inca civilisations in the 1500s to better manage their surplus of tomatoes and was shared around by the Spaniards during the Inquisition. Despite this rich history, salsa has changed and the sloppy salsa sauces we are so familiar with today are in fact an American appropriation of the southern states from the early 1920s and are found throughout many modern Mexican fusion recipes. This summer salsa captures the relaxed and temperate lifestyle of Mexican culture and is a diverse and changeable twist on a traditional favourite. Summer salsa adds a new spicy punch to DIY Mexican at home, as a pasta sauce or as a lovely zingy salad with a side of sourdough. 1. Using a sharp knife, finely dice tomato, cucumber, capsicum and Spanish onion into small, even cubes. The smaller the cubes, the greater the burst of flavour will be and the more you can fit into your taco. 2. Toss the chopped ingredients together in a large mixing bowl. Then, in a Pyrex jug mix together the lime, oil, Tabasco, and chopped garlic. Give it a good stir. 3. Slice the chilli into thin, lengthways strips, making sure to de-seed the middle section. If you choose to use Jalapeños, add a dash of their juices along with the chillies into the salad mix, this will add an extra level of fire for the brave are daring. 4. Tip the sweet corn and sprinkle finely, chopped coriander over the mixture, stirring through, evenly coating the salad with coriander. 5. Add the dressing to the salad mixture just before serving to avoid letting the salad get too soggy. 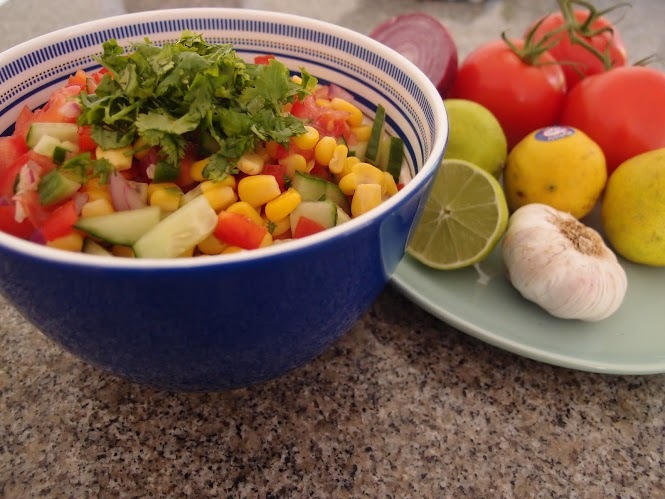 Finally, serve the salsa in a large bowl with a dusting of chopped coriander, heaped on top.